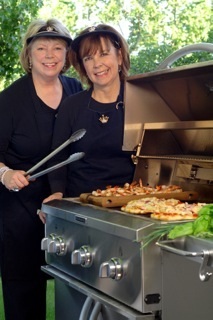 Longtime friends turned competition barbecuers Karen Adler and Judith Fertig (aka the “BBQ Queens”) have just released their latest book, The Gardener and the Grill (Running Press, 2012). 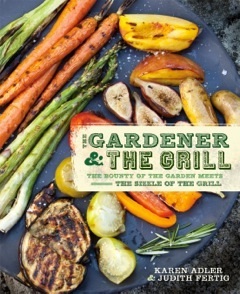 It’s a great resource for seasonal eaters, practitioners of “Meatless Mondays”, and year-round grillers. Among the recipes are Wood-Grilled Shrimp with Yellow Peppers, Grilled Gazpacho, and Planked Butternut Squash with Sage and Brie. Carnivores won’t be disappointed, either. Buy your copy at local booksellers or online at www.amazon.com. Karen Adler (left) and Judith Fertig grill up bounty from the garden.